[144 Pages Report] The gas sensors market is expected to witness high growth during the forecast period. The overall market is expected to grow from USD 812.3 million in 2016 to USD 1297.6 million by 2023, at a CAGR of 6.83% between 2017 and 2023. The base year considered for the study is 2016, and the forecast period provided is between 2017 and 2023. The objective of the report is to provide a detailed analysis of the market based on gas type, technology, end-use application, and geography; information regarding the major factors influencing the growth of the market (drivers, restraints, opportunities, and challenges); and a detailed value chain analysis. Moreover, the objective of this report is to strategically profile the key players and competitive landscape for market players, and provide information on product launches, acquisitions, partnerships, agreements, and collaborations in the gas sensors market. Some major players offering gas sensors for various end-use application are: Amphenol Corporation. (US) serves a number of end-use applications such as aerospace, automotive and transportation, and medical. Another major player City Technology Ltd (UK) serves applications such as safety, automotive, medical, and residential safety. The base year considered for the study is 2016 with historical years as 2014 and 2015. The estimated year considered for this study is 2017 and the forecast period is from 2018 to2023. The objective of the report is to provide a detailed analysis of the gas sensors market by technology, gas type, end-use application, and geography. The report provides detailed information regarding the major factors influencing the growth of the market. 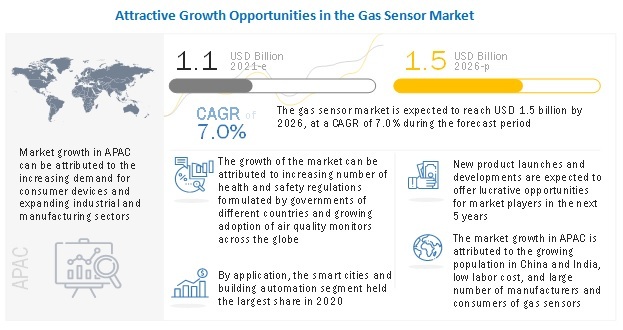 The research methodology used to estimate and forecast the size of the gas sensors market begins with obtaining data on key vendor revenues through secondary research. Some of the secondary sources used in this research include information from various journals and databases such as IEEE journals, Factiva, Hoover’s, and OneSource. The vendor offerings have also been taken into consideration to determine the market segmentation. The bottom-up procedure has been employed to arrive at the overall market size for gas sensors from the revenue of the key players. This data triangulation and market breakdown procedures have been employed to complete the overall market engineering process and arrive at the exact statistics for all segments and subsegments. The analysis of the gas sensors market includes extensive primary research to gather information, verify, and validate critical conclusions arrived at after an extensive secondary research. After arriving at the overall market size, the total market has been split into several segments and subsegments. The following illustration shows the breakdown of primaries conducted during the research study on the basis of company type, designation, and region. The ecosystem for gas sensors comprises manufacturers such as City Technology Ltd (UK), Dynament (UK), Alphasense (UK), Amphenol Corporation. (US), Bosch Sensortec GmbH (Germany), ams AG (Austria), SenseAir AB (Sweden), Figaro Engineering Inc. (Japan), Membrapor AG (Switzerland), and Sensirion AG (Switzerland), and MSA (US). 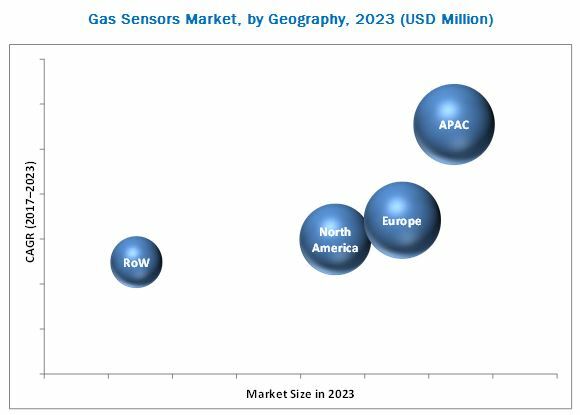 The gas sensors market is expected to be valued at USD 1,297.6 million by 2023, growing at a CAGR of 6.83% between 2017 and 2023. The major factors driving the growth of this market include increasing enforcement of occupational health and safety regulations by the government, MEMS-based sensors, development of miniaturized wireless sensors, and increasing awareness of air quality control among users. This report segments the market on the basis of gas type, technology, end-use application, and geography. The market for oxygen is expected to witness a significant growth during the forecast period. The rising demand for oxygen gas sensors used in the medical sector in devices, such as anesthesia machines, ventilators, oxygen monitors, and analyzers, is driving the oxygen gas sensors market. Also, oxygen gas sensors are used in huge numbers in automotive and transportation applications. The growth in the automotive industry is also driving the oxygen sensors market significantly. The gas sensors market for the oil & gas industry to hold the largest share during the forecast period. The market for the oil & gas industry is expected to account for the largest market share by 2023 as a result of increasing oil & gas projects, replacement of obsolete sensors, and continuously increasing demand from oil & gas industries from emerging economies. Increasing shale gas production in the US will also drive the gas sensors market in the US. Consumer electronics is expected to grow at the highest rate during the forecast period. The consumer electronics segment is expected to grow at the highest rate since gas sensors are expected to be integrated into smartphones, tablets, and wearable devices to detect gases such as alcohol, carbon monoxide, carbon dioxide, nitrogen dioxide, and VOCs. APAC to hold the largest share and is expected to witness the highest growth in the gas sensors market. The major drivers for the rapid growth of the said market in APAC are the rising investments in sectors such as infrastructure, housing, and medical care, which are attributed to the growing population and urbanization in the said region. The strong economic growth and increase in manufacturing industries, such as automotive, and metals and chemicals, in APAC are expected to drive the gas sensors market in this region. Water is a very common element used in daily life for personal, industrial, and commercial uses. Water treatment industry is among the largest end-user industries for gas sensors. Industrial wastes when directly mixed in fresh water cause severe water pollution. Water purification and treatment facilities produce gases such as ammonia, hydrogen sulfide, chlorine, methane, and oxygen as by-products of the treatment. Gas sensors are used to detect and monitor the concentration of these gases. Medical application is an important market for gas sensors. It includes a wide range of applications for oxygen depletion, carbon dioxide leakage, and for contaminant detection such as carbon monoxide, sulfur dioxide, and volatile organic compounds. Gas sensors are used in hemodynamic monitors to monitor oxygen concentration in blood and to perform blood gas analysis. Respiratory monitors also use gas sensors for detection of various gases such as oxygen and carbon dioxide Measuring blood oxygen. The oil and natural gas industry is one of the world's largest industries. Owing to the high demand for petroleum products, oil & gas companies generate huge revenues; however, their operating costs are equally high. Oil & gas process plants are prone to potentially harmful incidents that can affect people, assets, and the environment both in and outside a plant. The petrochemical industry deals with highly combustible and toxic gases that pose a significant risk to the work force at chemical plants. People exposed to these toxic gases face health issues such as skin allergies and cancer. Gas sensors in the oil & gas industry are used to detect different gases such as ammonia, carbon monoxide, carbon dioxide, chlorine, hydrogen, hydrogen sulfide, methane, propane, sulfur dioxide, volatile organic compounds, combustible gases, and oxygen deficiency/enrichment at oil & gas plant. Will the suppliers continue to explore new avenues for gas sensors in manufacturing? What are the upcoming technologies for gas sensors? The global " gas sensors market is growing at a faster pace, but there are some technical hitches that are yet to be addressed. Technical hitches such as high power consumption (with respect to applications for smartphones and tablets), high manufacturing cost, and deficiency in selectivity and complex fabrication processes are a few of them. Although, there are many technologies present in the market to manufacture gas sensors none provide all the required features. For instance, devices built on metal oxide semiconductor technology consume more power than an electrochemical technology-based device, whereas devices built with the combination of metal oxide semiconductor and silicon-based micromechanical free standing hot plates (silicon hotplate) technology results in minimum power loss. Other issues are operating conditions, e.g., gas sensors built with current technologies cannot maintain a high level of selectivity in the intense humid environment. Also, the sensitivity of the catalytic bead technology-based sensor is very high toward airborne contaminants, but excess exposure can lead to sensor malfunctioning. These are a few of the restraining factors hampering the growth of the global gas sensors market. The key players in this market are City Technology Ltd (UK), Dynament (UK), Alphasense (UK), Amphenol Corporation. (US), Bosch Sensortec GmbH (Germany), ams AG (Austria), SenseAir AB (Sweden), Figaro Engineering Inc. (Japan), Membrapor AG (Switzerland), and Sensirion AG (Switzerland), and MSA (US). *Details on Overview, Products Offered, Strength of Product Portfolio, Business Strategy Excellence, Recent Developments and MnM View Might Not Be Captured in Case of Unlisted Companies.